Six years in Fargo North Dakota provided work opportunities for Aaron Rasmussen and his wife, but brought along some unexpected challenges as well.It seems the nicest places to live in this flat, north prairie land are alongthe Red River but they are also the places most prone to flooding. But Fargo had given Aaron a job at Scheels, a sporting goods store and one of Wisconsin-based Trek Bicycle’s leading dealers. This connection for the Appleton native led to a return to Wisconsin and his association with a new venture spearheaded by the dream of John Burke, son of Trek’s founder DickBurke. Dream Bikes is a non-profit store (but not a charity, Rasmussen says)that fixes used bikes and sells them. That’s simple enough. The real dream is to use the assets of the youth in our community. Partnering with local Boys and Girls clubs, Dream Bikes hires teenagers ages14to 18 into their Job Ready program. Using a skills matrix, young people are trained in the bike business –from sales to maintenance. The skills necessary to run a business are taught as well, including budgeting and scheduling. The idea is to find young people with a dream and to help them fulfillthat dream. Dream Bikes looks for kids who have a passion to succeed, and teaches them the skills they need. Not an end in itself, Dream Bikes calls their program “Up and Out.” The idea is to learn the skills necessary to be successful, then move on to another job. For their first “round” of trainees, the store interviewed 60 and hired 10 applicants. There are a lot of cheap bikes out there. 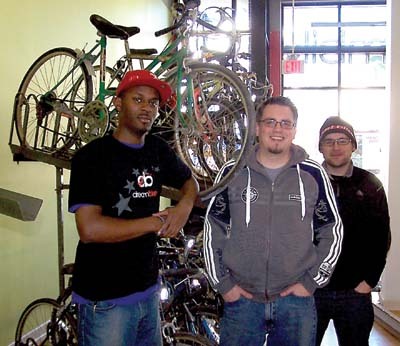 Dream Bikes aims to recycle used bikes of better quality and provide them for sale to the community. Pricetarget range is from $25 for kids’ bikes and $75 to $500 for adult bikes. Rasmussen says a lot of discount store bikes are not even assembled correctly when you take them out of the store. Program participants will be trained to repair the bikes to safe and efficient operating condition. They will accept bike donations at their Martin Luther King Drive location during business hours. Dream Bikes is always looking for used bikes for their inventory. Who is their market? The neighborhood, Harambee, Riverwest, Rasmussen says. “We want people who wouldn’t go into a bike shop.” The goal is to match desired useto the type of bike sold, not prestige selling. There will be a little “niche” marketing for bike enthusiasts. How will they support their efforts? Foundations such as the Greater Milwaukee Foundation and the Trek Foundation help get stores like this one up and running. Sales income goes to the wages paid to the program participants. The goal is to be self-supporting through bike sales in two years. The first store opened in Madison. The Milwaukee store should be open b ythe time this issue of the Currents goes to press. All Boys and Girls Club members get a 50% discount on Dream Bikes. If you need to ride a bike to work and you don’t have the money to buy one, Dream Bikes has a need-based microfinancing in-house program to get you on the road.